Quick and simple, these delicate biscuits marry bittersweet chocolate with a zingy burst of lime. 1. In a large bowl, cream the butter and sugar until pale and fluffy using electric beaters or a freestanding mixer with a paddle attachment. Beat in the vanilla paste (if using) and the lime zest and juice. 2. Mix together the flour, cornflour and a pinch of salt in a separate bowl. Gradually work into the butter to form a stiff dough; if it’s too crumbly, add more lime juice. 3. Roll the dough into a log shape about 6cm in diameter and wrap tightly in cling film. Gently press one long edge of the log on the work surface, to a rounded point, smoothing it to create an egg-shaped cross-section. Chill for at least 1 hour. 4.Preheat the oven to 180˚C, gas mark 4. Using a sharp knife, trim the ends from the dough, then slice into 0.5cm-thick biscuits. Spread over a few parchment-lined trays and bake, switching the trays halfway if needed, until just starting to colour – about 12-15 minutes. Leave to cool on a wire rack. 5. Melt the chocolate in a bain-marie or microwave, then pour into a disposable piping bag. 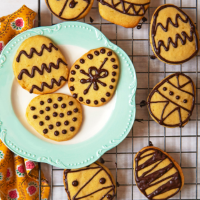 Leave to cool and thicken for 10 minutes, then cut a small opening and pipe decorations – try stripes, zigzags and spots – onto your Easter cookies.